Editor’s Note – Two farms in Columbus, OH are increasing healthy food access for their local community. This article was originally posted on Seedstock and written by Jennifer Ison. Two five-acre urban farms in Columbus, Ohio are offering a hardy mixture of hope, employment and improved food access to underserved community members. The farms, collectively known as the Urban Farms of Central Ohio, are part of a nonprofit, sustainability initiative created by the Mid-Ohio Food Bank to revitalize the neighborhood of Grove City. Sarah Lenkay, Strategic Projects Manager at the Mid-Ohio Food Bank, says that the Urban Farms of Central Ohio initiative is centered on the idea of fostering hope for the community and lasting, valuable education. The two sites that the urban farms occupy were part of a land access grant given to the Mid-Ohio Food Bank by the Columbus Land Bank to repurpose underutilized properties.The more fully-developed of the two farms, Clarfield Farm, was once an elementary school that was part of the Columbus City School district. The second urban farm, Wheatland Farm, is in the beginning stages of development on the former site of the Columbus State Hospital, a psychiatric hospital that was demolished in 1997. Each farm site maintains its own produce stand and employs high-tunnel structures to allow for year-round growing. Crops grown include tomatoes, peppers, eggplant, beets, radishes, leafy greens, collards and lettuces. According to Farm Manager, Dana Hilfinger, together the farms are expected to yield 50,000 pounds of fresh produce this year, a sixfold increase from just two years ago. Much of that produce goes toward supplying weekly orders to 11 area restaurants, including the South Side Roots low cost market and café, another project of the Mid-Ohio Food Bank that aims to increase cost-effective and healthy food options to neighborhood residents. Hilfinger collaborates with community members and restaurant buyers each winter on crop planning to insure their needs and expectation are met, and to discuss menu flexibility to account for seasonality. “We are open to developing our menu to highlight crops that our farmers have an interest in growing,” says Cara Mangini, chef and founder of Little Eater, a local restaurant that sources produce from the Urban Farms of Central Ohio. 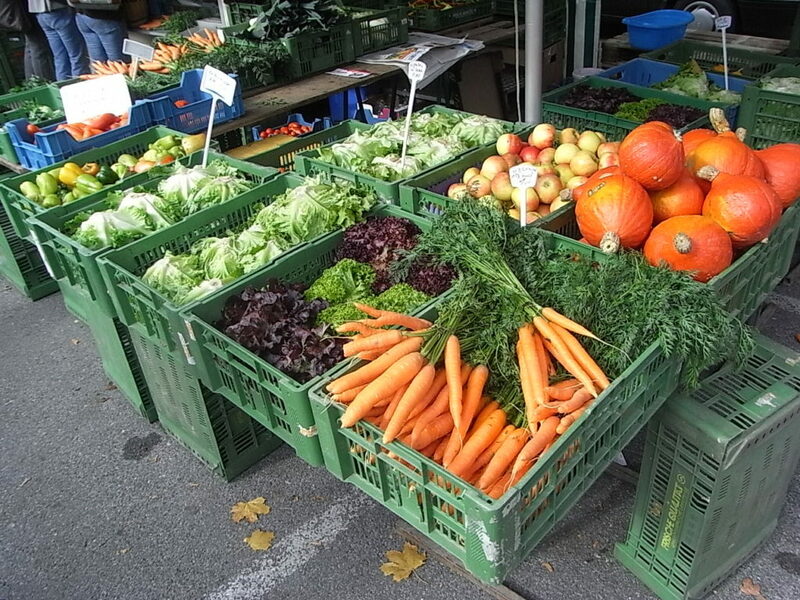 Produce grown on the farms is also sold at farmers’ market. The proceeds from these sales to restaurants and farmers’ market patrons allow the farms to provide free food to underserved local residents. Any leftover profit is reinvested into the two farms. Community enrichment is also a big part of Urban Farms of Central Ohio’s mission. The initiative’s new youth job-training program, which debuted this summer, provided eight high school students interested in urban agriculture with an opportunity to participate in a two-month program that armed them with skills ranging from cultivation and marketing to public speaking and resume writing. The students collectively dubbed the “Jr. Farm Crew” not only learned how to harvest the crops, but also how produce is sold to restaurants and provided to the community. Darien has since volunteered to take food to her neighbors, increasing awareness of the farm throughout the community due to her curiosity and interest in learning about how to grow food. “It’s great to see the kids actually digging in the dirt,” says Hilfinger. The Urban Farms of Central Ohio were created because of the community’s need and potential for sustainability. Lenkay describes an ideal future for the farms as self-sustaining, neighborhood sources for food, income and awareness that build community, promote happiness, health and success.